News.com.au reported on David Creato Jr, who was pleaded guilty in August to aggravated manslaughter after a previous murder trial ended in a mistrial. The child he killed was his three year old son, Brendan. His 17 year old girlfriend was not accused of any crime. There is no evidence she participated in Brendan’s killing or did anything to incite his death. Creato pleaded guilty to killing Brendan, he is not the victim of a teenager’s manipulations. He is an adult and a father and he made his own choice about killing his son. Men are responsible for their choices to commit violence. 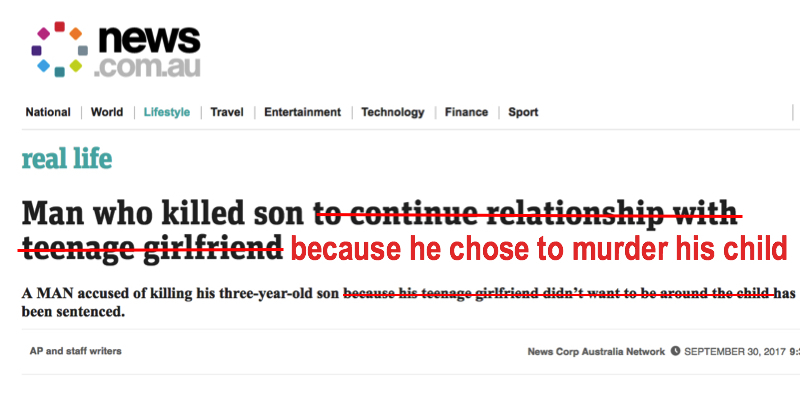 The media has a job to do in reporting on violence but it is not their job to excuse it or shift the blame for men’s choices onto the female partners.